This service shows all system fonts installed on your Windows computer and only works with Windows Internet Explorer browser. The reason why it works only in IE is that it's a browser-specific solution. This online tool lets you preview text written in all installed fonts on your computer to help you choose the best font for a particular job. 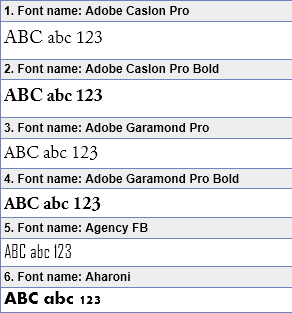 After you have set a default text, a font size and font style (italic, bold or underlined), this tool gives a list of all fonts installed on your system and displays the text and font settings in a simple table. Characters entered: Max 400 chars allowed.